Do you know how difficult it is to improve your fitness level? It doesn’t just require a ton of hard work and dedication, but it also entails getting the right gear for the job. For instance, do you know exactly how hard you’re working out? Well, you will – if you get the best heart rate monitor watch. These devices will keep track of your heart rate so you can plan your workouts accordingly. They help you understand your fitness level, and some even offer various modes and motivations for you to work harder and smarter. But where can you find such a thing? That’s why we are here to help! In this article, we’ll start you off with some great advice on the matter. Our short buying guide is then followed by a list of 8 amazing products, which we analyze very thoroughly, including their downsides along with their advantages, so read on. Getting a great watch for monitoring your heart rate means deciding what you actually need it for first. So we’ll discuss the purchase factors below according to your purpose. Of course, you want to spend as little money as possible and also get a very accurate device. But the fact is that a proficient sensor entails a better technology, which, in turn, means spending a bit more. So if you’re interested in getting a bang for your buck, you can get some fairly accurate devices, but these won’t have a medical precision to measuring your heart rate, and they might not get things like your exact step count either. 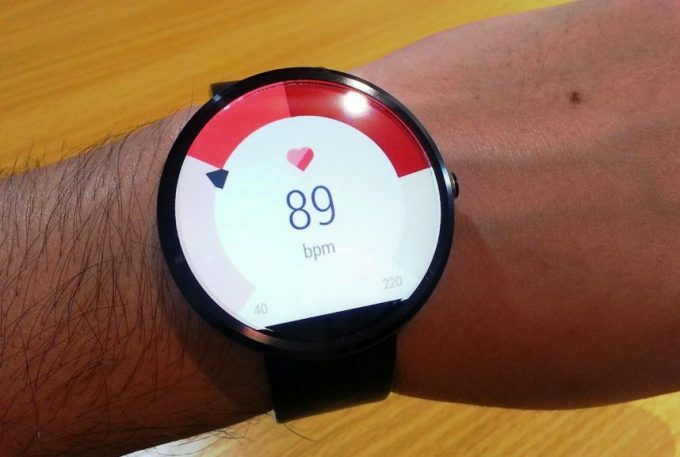 The more expensive heart rate watches will provide astoundingly exact measurements, though. Some even come with a chest strap for increased accuracy, and that can be paired with gym equipment. If you just want a basic, inexpensive heart rate watch, you might not need multiple modes and functions. So if you just want to move around a bit more, and get a general idea of your fitness level, you don’t need fancy modes and functions. Otherwise, if you do a specific sport or cross-training, it’s great to be able to set your watch for different modes. It’s amazing if you can get different target zones for measuring your heart rate too, that way you’ll know exactly how hard you’re exercising. Other than that, a sleep monitor and a few notifications come in very handy too. Depending on how hard you’re exercising and the environment you’re doing it in, you can judge the needed resistance of your watch. For instance, hiking demands more impact/ scratch resistance, while running demands a bigger water resistance. Battery life can also be included here, you need a device with a longer battery life if you’re using it mostly for daily activities. Otherwise, if you’re more interested in the sports modes provided, you can sacrifice battery life for that assuming you’re not training 24/7. Getting a large enough display so it’s easy to read is essential, but sometimes that might inconvenience people with smaller wrists. So a 0.94 – 0.96 inches display is generally good enough for most wrist sizes. You also need a display that’s easy to read in direct sunlight if you’re cycling and don’t want to stop in the middle of your trail to get an accurate insight of how you’re doing. A backlight proves really useful in dim light circumstances, like when you’re running after nightfall. The wristband should be comfortable enough so your watch can be worn throughout the day without chafing your skin. So the best materials are silicone and rubber, though you might find some rubber wristbands look fairly cheap. You should also be aware that some wristbands don’t allow such a great heart rate reading when you sweat. That means you need to wipe off your hands quite frequently or use these watches for low-impact activities. With that in mind, let’s review some amazing watches and see if you find something you like. The watches below come in different shapes, sizes, colors, and prices. They all have different features that make them suitable choices according to your preferences, so read on. 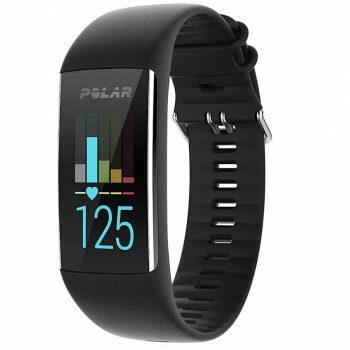 The Polar Ft1 Heart Rate Monitor Watch is great for monitoring your heart rate, but the feature we love most about this watch is its display. This is large enough to read easily, but also not so large that it would inconvenience you. Besides, the backlight makes it easy to read regardless of the light. There is also the possibility to select between target zones to get the best workout, and these are manually set. So you won’t actually get an automatic reading of how hard you’re working out, but you will get a summary afterward so you can plan better objectives. It’s quite easy to start this watch too, you just press one button, and the coded heart rate transmission is simply amazing when it comes to decreasing cross-talk. The wristband is made of rubber, so it’s comfortable enough, though it might look a bit cheap. Also, the 8.5 inches total length is accommodating enough for most wrist sizes. This watch is fairly resistant too, especially since it can be submerged up to 165 feet in water. However, it’s best not to use it for diving, just swimming will do. So what can possibly be the disadvantages to such a terrific watch? Well, it’s a pretty basic model, so apart from the date, time and heart rate measurements, you won’t get anything else like the calories burnt. It’s also quite heavy at 3.8 ounces, and it’s not the best looking watch out there. 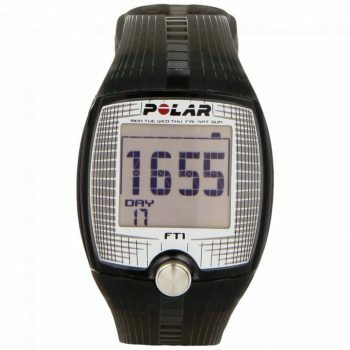 Related: If you want more accurate heart rate measurements, you can also pair this device with the Polar T31 Non-Coded Transmitter, which is actually a chest strap. This also comes with its own belt, it’s easy to use, inexpensive, and it can really help improve your workouts. 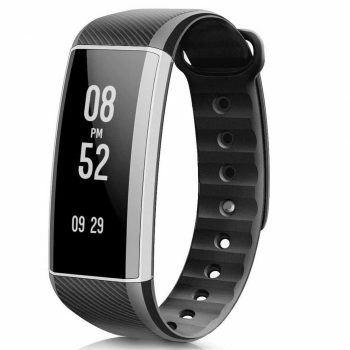 The MoreFit Slim HR Fitness Tracker Watch is a much better-looking watch, it has a very slim design, and it’s half the price of the Polar FT1. You’ll also get plenty of measurements that include an automatic heart rate monitoring throughout the day, your general activity status, as well as sleep monitoring. Besides this, there are 14 modes you can use for different sports, which means you’ll be getting a highly versatile device. That will also help you reach your objectives faster, get a better grasp of how fit you are and where you need to improve. The battery life seems pretty long too, the official specs state it can last for more than a week without recharging, but that only happens when you’re not using the sports modes. The screen turns on not with the push of a button but by moving your wrist. That might be helpful when you’re running, but sometimes it just means the watch turns on and uses up the battery when you don’t want it to. This watch can be paired with an app without any problems, the OLED screen is 0.96 inches, so it’s large and bright enough for an easy reading, and we love that you can also swim with it. The heart rate monitor itself is fairly accurate too, but the GPS fails to work most of the times. It’s also pretty difficult to set a connection with other apps, and the step counting feature might be a little off sometimes. Related: If you want to replace the wristband of this watch, you can always select the MoreFit Slim HR Plus Band. This is inexpensive, comfortable and has a reliable locking mechanism, which is why we like it so much. The EIVOTOR Activity Tracker supports a wireless connection with your smartphone via a 4.0 Bluetooth. Besides, this doesn’t use up too much power, so it won’t mess with your battery life. And if you pair it up with your phone, you can easily keep track of all your activities because syncing the data is fairly easy. We love the detachable design too, especially because of how easy it is to charge it, which only takes a couple of hours. This watch comes with its very own easy-to-read touchscreen OLED display too. That makes it easy to use as well, and the IP65 waterproof rating renders this watch resistant to water splashes, so it’s virtually rainproof. You’ll get multiple other readings too apart from the time and date and obviously the heart rate, like the number of steps you take, burnt calories and the distance you walk. That’s why this is great for walking or running. And if you use the sleep monitor, you can keep track of how well you’re resting. There are also plenty of alarms, like a silent vibrating alarm for waking up, call and message reminders. On the flipside, the profile isn’t that slim, it looks a bit cheap when you first glance at it, and the clasp-to-close system might not be the most reliable on the market. Related: If you want a new tablet that can work with this watch, we really recommend the All-New Fire 7 Tablet. We like it because it works well, it’s easy to set up, it has a slim profile and it’s quite inexpensive. The LINTELEK Fitness Tracker Watch is another terrific watch with 14 different sports modes, which makes it really versatile. It’s awesome that you also have an included pedometer, calories and distance tracker, but the heart rate monitoring is really the cherry on the cake. That’s because it’s a very accurate heart rate tracker, so you can definitely use this for planning your workouts. The sleep monitor is a great addition to understanding and planning your rest periods very carefully, and we also really appreciate the silent wake-up alarm that vibrates. It’s easy to connect this watch to your phone’s GPS, which means you can use this watch for running. You’ll get a good grasp of your stats, understanding your pace, looking at the map of where you ran and the total distance. The 0.96 inches touchscreen is wide enough for an easy read, and you can also customize it to look cool too. The IP67 waterproof level seems like it’s very high, but in fact, it’s just a life waterproof watch. So no swimming with it, maybe keep it on during a light rain, or when you’re showering. The standby time is about one week, give or take, and that seems pretty nice too. You’ll get plenty of alarms and notifications, like a weather forecast, music control, sedentary alerts, as well as various SMS and SNS notifications. On the downside, you’ll only get a reading of your calories burn when you’re actually moving, which is a bummer because you can’t compare that to the calories burnt while resting. The display is also pretty difficult to read in direct sunlight, so you need to stop and cover it with your hand, which means losing some time. Related: The Lintelek TPE Replacement Straps are just amazing for pairing this watch with different outfits. It’s not really likely that the actual wristband will get ruined, so the reason we recommend these replacement straps is basically because they’re inexpensive, and it’s cool to change your look once in a while. 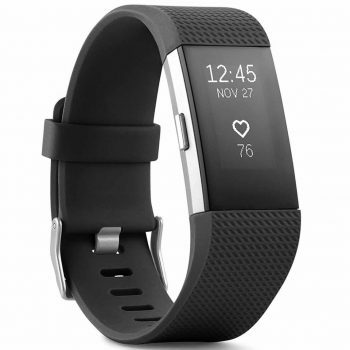 The Fitbit Charge 2 Heart Rate is packed with features that explain why this watch has a much bigger retail price than its competitors. For instance, the Pure Pulse Heart Rate is a registered technology that keeps a very accurate track of your heart rate throughout the day. 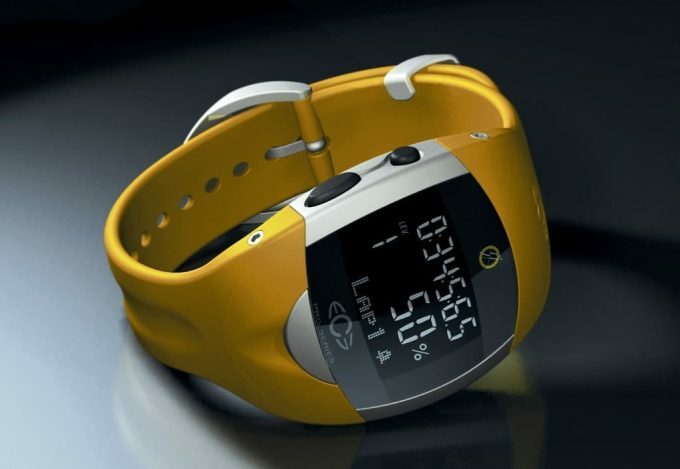 This watch will also monitor your progress in different sports thanks to its versatile and accurate sports modes. Besides, the fact that it offers guided breathing sessions is an amazing plus, we all know how important relaxation is for improving our fitness level. You’ll also get an all-day activity monitoring because that can help you understand and plan your workouts better, as well as the rest of your day. 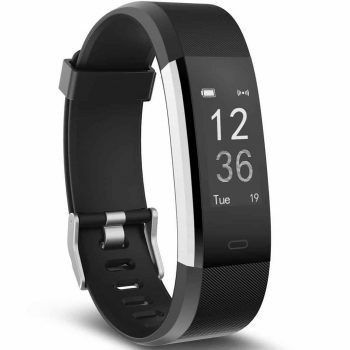 The auto-sleep monitor is very precise as well, and the trademarked Smart Track means your watch will start tracking your stats automatically, and that it recognizes the type of exercise you’re doing. If you remember, that was our quarrel with the Polar FT1. In terms of notifications, you’ll get sedentary alarms, call, text and calendar alerts. This is a daily waterproof watch too, but it comes with a downside. If you sweat or otherwise get the wristband wet during your workouts, that might mess with your pulse readings. Related: With a 3.3 feet charging cable and an easy-to-use design, the Fitbit Charge 2 Charger is just what you need for this watch. The special anti-slip design is awesome, so you can use this charger literally anywhere, which is great especially when you’re on the go. The Polar A370 Fitness Tracker is another expensive watch, but it’s a very intelligent device too. The continuous heart rate monitoring is great, you can easily understand what spikes your pulse and when you’re calmer. That’s amazing not just for understanding your fitness level, but also understanding how stress-filled your life is. The assisted GPS use is amazing for walking or running. You can get readings of the speed you’re going with, the total distance and your route. Apart from that, there are plenty of notifications you’ll see, both SNS and SMS, and the calendar appointment feature is simply life-saving. We’re also head over heels with the sleep analyses provided by this watch. Besides, since the wristband is so soft and the buckle closing system is so secure, you won’t have any issues with it coming undone or inconveniencing you in any way while sleeping. 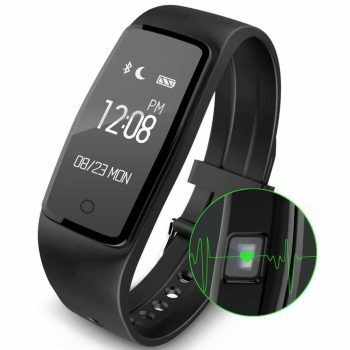 You can use this watch as a heart rate sensor too if you pair it with a fitness app of your choice. And the great news is that there’s a wide third-party compatibility, you can even use the heart rate zones for a more profound understanding and planning of your workouts. The downside of this watch is that the step tracker doesn’t work that well. However, you can successfully use it for strength training at the gym, though the battery life isn’t that amazing either, so you’ll probably have to charge it every two days or so. Related: The Aenllosi Chest Strap Hard Case is hands-down the best case you can ask for storing any Polar heart rate tracker set. So you can safely transport your watch and its chest strap because this EVA case is durable, resistant to crashes and water, not to mention anti-shock. The Buenavo S2 Fitness Tracker is a refreshingly less expensive device, and it looks amazing – probably even better because of that. Anyway, we love the slick profile, the touchscreen is easy to use, and the heart rate tracking is automatic, though not as accurate as that of the previous two items we reviewed. Anyway, we like that this device is very light, which makes it comfortable and convenient. 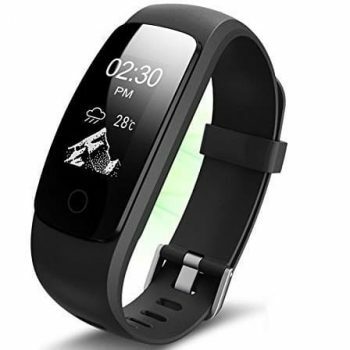 This watch is better used for tracking your daily activities, like how much you’re walking, how many steps you’re taking and how many calories you’re burning. However, note that it’s not the most resistant watch out there, it can easily be scratched and it’s just life waterproof. The sleep monitor is good enough too, and the silent vibrating alarm is definitely a plus here. You can also sync this with your smartphone to get SMS and SNS notifications, but also for activating the anti-lost function to find your phone. 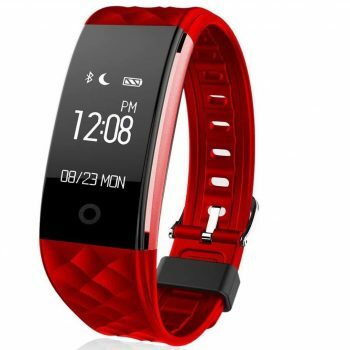 You can also use your phone to take pictures with the smart wristband, or for playing music, which is a great motivator. Related: If you want to protect this watch from impacts and scratches, you’d better get the Fitbit Charge 2 Screen Protector. This pack offers six different screen protections, which are really amazing against the damages made by water and dust. The Alisten Fitness Activity Tracker is another low-priced heart rate monitor, but it comes with a 1-year manufacturer warranty, which means you can return and replace it if you’re not happy with how it works. The support team is also very helpful, which shows real concern with the user experience. Apart from that, this is a fairly basic device. You’ll get a dynamic heart rate monitor for measuring your pulse throughout the day, as well as an activity tracker with included readings of your steps, distance and burnt calories. You can also use the built-in Bluetooth 4.0 and connect this watch to the app, so you can keep track of your readings, though the connection might fail once in a while. The sleep monitor analyzes deep and light sleep as well, and the vibrating alarm is there for a quiet waking up. We love that there’s a bicycle mode and that you can also use various other modes with the app. This isn’t a fully waterproof device though, so you can’t use it for swimming or anything, even if it has a high IP67 waterproof rating. The alarms for messages and other notifications are great, the 0.96 inches OLED display is easy to read, and the 7-day battery life on standby is pretty long, meaning this watch is definitely a bang for your buck. Related: If you need a great motivation when you’re working out, there’s nothing better than some music. So the Aulker Bluetooth Sport Headphones fit the bill extremely well, we love that they’re noise-canceling and that they’re really comfortable and ergonomic. We started this article promising you that you’ll find a great watch for your purposes. We hope that our short buying guide was complete enough with the info you needed for that. We also hope that the products we selected met your standards. That said, we’re curious to hear more from you. What device will you get from our list of gadgets? 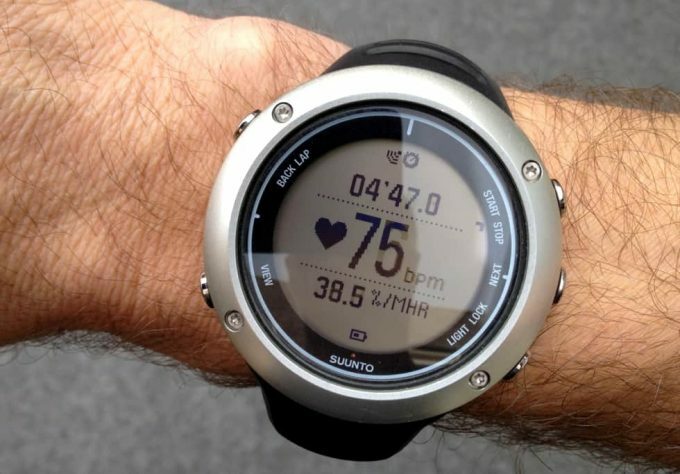 Did you own a heart rate watch before, or will this be your first? Leave us a comment below.